Exceptionally light and spacious, these elegant, serviced apartments have recently been refurbished to an impeccable standard. Luxury is the word here and the apartments boast beautiful period features, stunning contemporary furnishings and 3.5 metre high ceilings. There's even a world class spa, gym and conference facilities.Ideal for use as a holiday apartment or for a business trip, you'll find every imaginable comfort - a fully equipped kitchen, luxurious bathroom and even walk-in wardrobes! There's a flat screen TV, Sky TV, dvd player and wireless broadband. 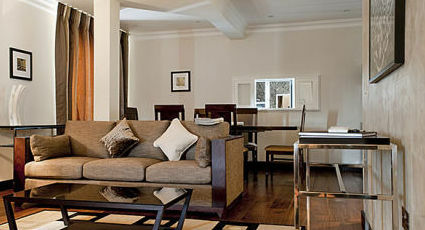 A housekeeping service is provided and multi-lingual concierge staff are on hand 24 hours a day. These short stay apartments are minutes away from top attractions such as the V & A, Science and Natural History Museums. The Royal Albert Hall is a short walk away, as too is Kensington Palace. When it comes to shopping you're spoilt for choice, with Knightsbridge, home of Harrods and Harvey Nichols, nearby. South Kensington and Gloucester Road tube stations are within easy reach, providing easy access to the West End and City. Victoria and Paddington railway stations are a few stops away, for national rail services and the Heathrow Express.